Are you done with your Christmas shopping yet? There are always last minute gifts that you need to grab and get ready before the holidays. Here are fives super simple, fast, but still adorable gift ideas for the hard to buy for people on your list. These are great ideas for teachers, neighbors, family, friends, anyone that you aren’t sure what to get for Christmas! I spotted this cute idea on Pinterest as a gift for your neighbor. They suggested that you package it with Ding Dongs and write Ho Ho Ho from the Ding Dongs next door. How funny is that? I decided to leave out the Ding Dongs and just give the Ho Hos. I thought these would be a great gift to give to the men in the family just as a fun little treat. 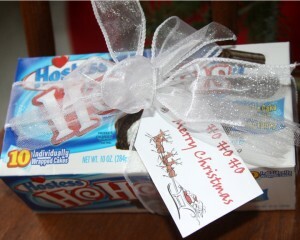 I just tied a package of Hostess Ho Hos up with some white ribbon and tulle and added a tag that says Ho Ho Ho Merry Christmas. A great little something to give to brighten someones day! I think I will send these to my son’s teachers and leave one for the mailman just for fun! I was lucky enough to find a candy assortment bag that had jolly ranchers in pink, green, and red. 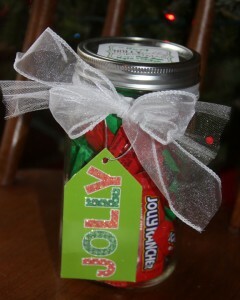 I picked out the Christmas red and green ones and put them in a large mason jar. I added a bow and a tag that said “Have A Holly Jolly Christmas, It’s The Best Time Of The Year, And We are Glad You’re Here!” This is a great gift for a new boyfriend or girlfriend in the family or a friend that is visiting. 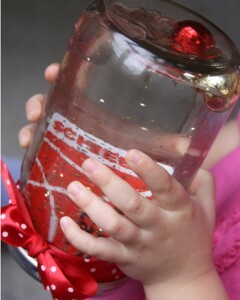 I found these great printables and added them to the top of the jars to personalize. AH, gift cards! Everyone loves to get them, but I am never very excited to give them. I always feel a little like I am cheating, like I didn’t put forth my best effort or something. But, it is no doubt the gift that is best gift to give sometimes. This idea I also found on Pinterest via the Katie Brown Blog and I was so excited to find a way to give a gift card that was extra special. Just hot glue the gift card to the inside cover of a mason jar (so it is standing upright), and fill the jar with glitter, water, an anything else pretty that can get wet. Tie with a pretty bow and tag, and Ta-DA! A very special snow globe that includes a gift card to someone’s favorite store. If I am going to give a gift card – this is defiantly the way I am going to do it! The hot glue peels right of the gift card after you give it, and I think I will wait to fill them with water until the day we are giving them just to be safe. 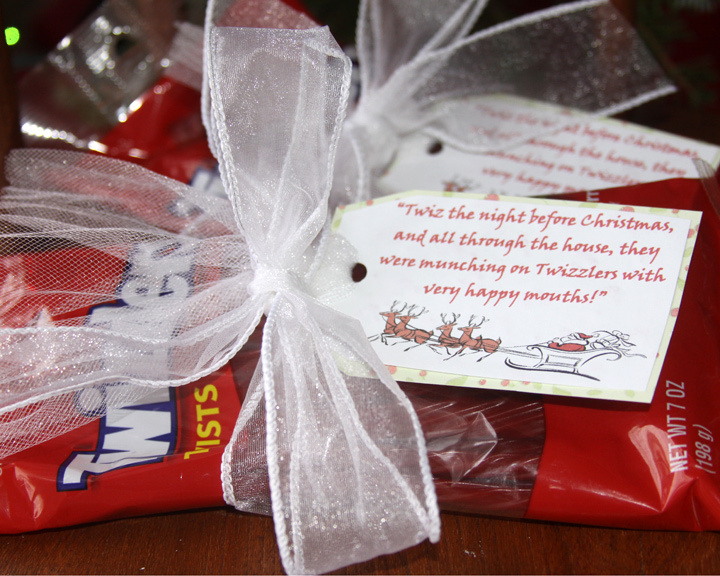 Last but not least here is a super quick gift to make and give to just about anyone. Two cute little throw pillows wrapped in a pretty ribbon. 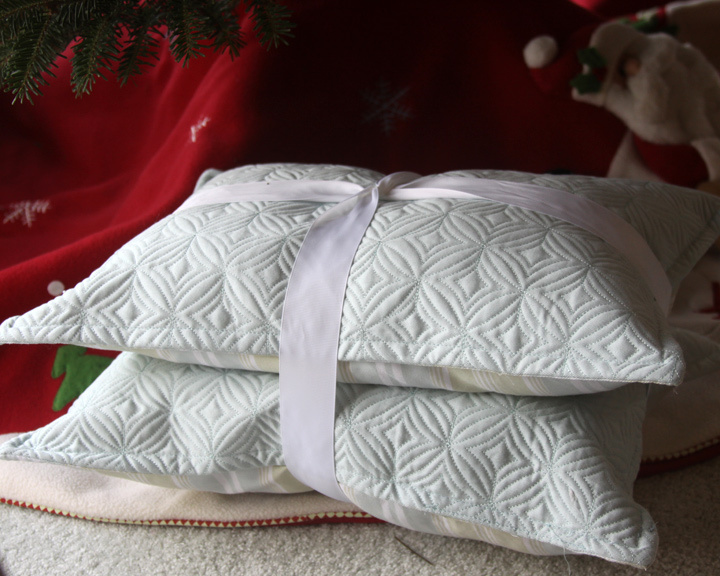 These throw pillows are made using two pretty quilted place mats and take a whopping 5 minutes to put together. They are absolutely adorable when they are finished and can easily be customized for the recipient depending on the place mats you choose! You can read the step by step instructions on these DIY place mat pillows if you want to make some yourself! I love to give homemade gifts and personalize things for my loved ones. Putting a little time and a lot of thought into a gift is always the best way to give!